Use floor transitions to reduce floor height differences between types of flooring. This tile to carpet transition strip is for 1/4" carpeted floor transition to 1/8" tile. The tile to carpet transition strip is made of durable rubber which stands up to heavy use and is ADA compliant. 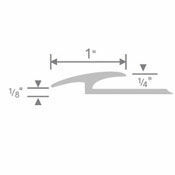 The total exposed transition is 1". A detailed image is shown at the bottom of this webpage. These tile to carpet transition strips are sold in standard 12' sections. Floor transitions can be easily cut to size. 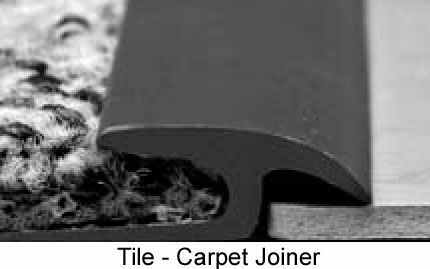 Due to length, the tile to carpet transition strips are shipped rolled up in a coil. Simply uncoil and lay flat to use. 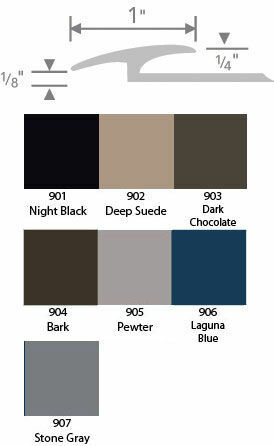 This style floor transition is available in shades of black, gray, brown, and blue. Scroll down to the bottom of the page to see color samples. Keep in mind the actual tile to carpet transition strip coloring may be slightly different since individual computer screen settings may not show true color. Installation of floor transitions is easily done with Transition Adhesive. Order your tile to carpet transition strip today.